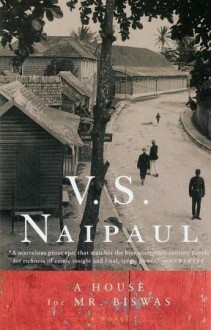 The early masterpiece of V. S. Naipaul’s brilliant career, A House for Mr. Biswas is an unforgettable story inspired by Naipaul's father that has been hailed as one of the twentieth century's finest novels.In his forty-six short years, Mr. Mohun Biswas has been fighting against destiny to achieve some semblance of independence, only to face a lifetime of calamity. Shuttled from one residence to another after the drowning death of his father, for which he is inadvertently responsible, Mr. Biswas yearns for a place he can call home. But when he marries into the domineering Tulsi family on whom he indignantly becomes dependent, Mr. Biswas embarks on an arduous–and endless–struggle to weaken their hold over him and purchase a house of his own. A heartrending, dark comedy of manners, A House for Mr. Biswas masterfully evokes a man’s quest for autonomy against an emblematic post-colonial canvas. A wonderfully told novel about a very ordinary man getting through the trying circumstances of his life as a Trinidadian Indian. Mostly there are his numerous in-laws, engulfing his life and his dreams. Mr. Biswas eventually gets the house, but never a room of his own. Funny, sad and moving.